It's like being on a roller coaster. 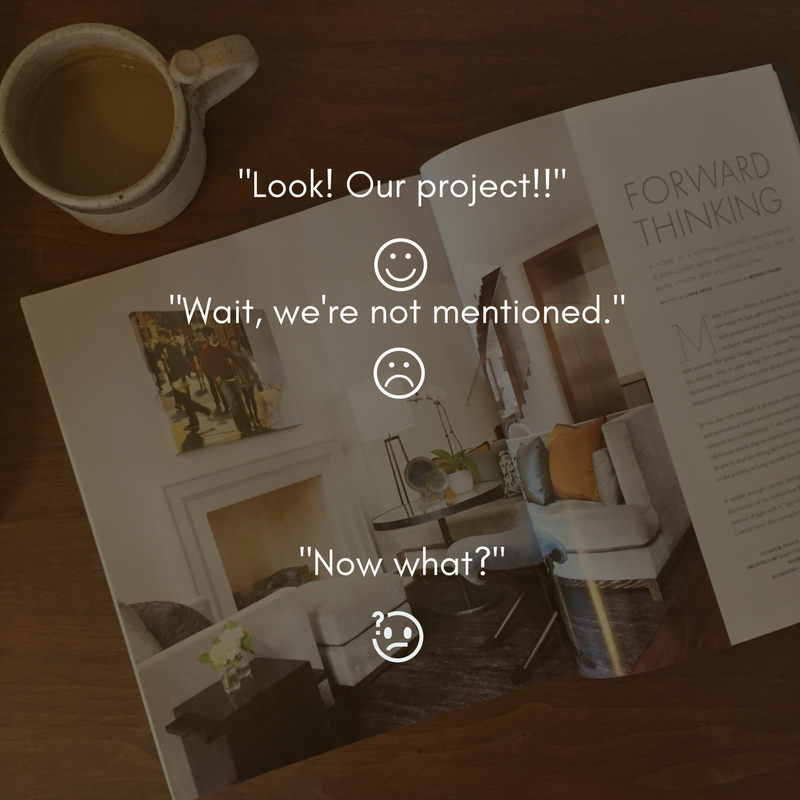 Seeing a great profile of your project only to discover that the story doesn’t credit your hard work as a designer or subconsultant lands you in a mix of emotions: You’re elated! Maybe a little hurt. Then, indignant! Wasn’t this a team effort? There are dozens of reasons why a subconsultant may not be given credit in an article. Regardless of the reasons, let’s focus on what you CAN do to make the press coverage work for your firm, even when you don’t see your name in print. Graciousness goes a long, long way. Yes, it hurts when your hard work on a project isn’t recognized. But most of the time, the reason has more to do with poor communication and the silos in our industry that encourage everyone to keep things close to their chest. So assume the best, be amiable, and reap the benefits of going high. Don’t let the publication off the hook. Send a polite (that part is important!) note to the editor saying you're thrilled about the article, your clients just love and read their publication (if they do), but that they forgot to give proper design credit. Ask if that can be rectified on the digital version of the article. Offer to send them a list of all team members and have it approved by prime and/or owner. Also, this is a great opportunity to share additional story ideas of your own you believe their readers would enjoy! Find out if you can use the photography. If this is an important project to your portfolio and the article has better photography than yours, research if you can purchase a license for images. Contact the photographer listed to inquire about purchasing rights. She’ll be able to tell you who commissioned the photographs. You’ll also need permission from the firm that commissioned the photographer. Be prepared that they may or may not add to the photographer’s fee to help cover their costs of the original shoot. Photography can expensive. It’s also your firm’s legacy, so make the investment for important projects. Get your own media machine running. Design an email blast that includes a visual of the article and the name of the publication in addition to the link. Say that you were thrilled to collaborate with the prime and owner on the project. Add what you did on it. In everyone’s mind who reads the article through your blast, you are in the article. Write a blog that references/links to the article but expands on the story from your discipline’s perspective. Use sketches/progress images that tell your story of the project. Think of it like the back story on what you did and why. Here’s an example. Instead of just getting permissions, request a quote from the prime/owner about your collaboration. They will be much more likely to help promote your blog post. Andy Crestodina at Orbit Media has some great suggestions for collaborating to give your blog posts more power (and fun). Then, see if there’s content you can repurpose into a media pitch and send it with a note to the editor of your discipline’s professional publication. Tag the prime, the owner, other team members and the publication as you express your pride and pleasure about the article. Promoting and giving shout-outs to your prime and team members will reinforce your firm as a team player, go a long way to fostering goodwill, and increase the likelihood of social shares/greater visibility. It may even mean that next time, you’re given credit! Link your most recent media coverage in your signature line of your emails. Link the article on your website in your list of recent press. Not getting credit in an article about a project you’ve sweated over can hurt, but there are plenty of things you can do to leverage that media coverage to your advantage. Proactively use your own communication channels to link yourself to the article. Be gracious and include shout-outs to as many others involved in the project as you can. Utilize resources in the article (like photography or quotes) in future content about the project within your own marketing. If you follow these steps, you’ll be able to reap plenty of (measurable!) benefit from media coverage about your projects. Next month, I’ll offer three simple tips on how to position your subconsultant firm for better media coverage before an article is published. Want those tips in your inbox? Sign up for my newsletter.